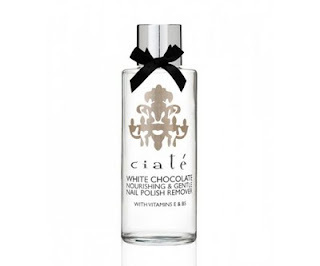 I always like it when beauty companies try to inject an element of something special into an everyday product and that's exactly what Ciate have done with their nail polish remover. Unlike standard nail polish removers which leave an overpowering, chemical scent, Ciate White Chocolate Nourishing & Gentle Nail Polish Remover leaves a tempting chocolate scent on nails once dry (disappointingly, there's still the chemical scent when using the remover wet). What's more, it works effectively to remove polish. My only complaint would be that the neck of the bottle is quite small so you need to tip the bottle quite a few times to saturate a cotton pad but that's hardly a big deal. Otherwise, the presentation is fantastic with a weighty glass bottle and feminine design. At £14 for 250ml, it is pricey. I think this would make a nice gift as part of a pampering package for someone who's into home manicures but personally, I'd find it difficult to justify spending that amount. I love the sound of this, I think I say that for everything you review but I really mean it! I don’t think I would ever purchase at that price point though when you can get things that do the same job for so much cheaper.